(CNN) -- Sudan ordered a number of international aid agencies to leave the country Wednesday after an arrest warrant was issued for the country's president, a United Nations source in the capital city of Khartoum said. 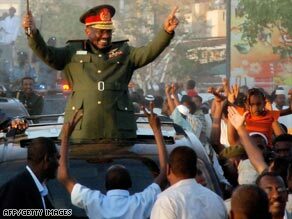 Sudan's President Omar Hassan al-Bashir waves to supporters in Khartoum on Wednesday. The International Criminal Court issued the warrant earlier Wednesday for President Omar Hassan al-Bashir for war crimes and crimes against humanity. It accuses him of complicity in a brutal campaign of violence against the people of Darfur, in the west of the country. Sudan told as many as 10 humanitarian groups to leave Darfur, and seized the agencies' assets, U.N. deputy spokeswoman Marie Okabe said. The aid groups include Oxfam, Solidarities and Mercy Corps, she said. The exact number of groups involved was not given and some groups were not identified, both to protect their people on the ground in Sudan and because they are hoping to reverse the decision. U.N. Secretary-General Ban Ki-Moon is "concerned" about the reported expulsions, a spokeswoman said. "He notes that this represents a serious setback to lifesaving operations in Darfur, and urges the government of Sudan to act urgently to restore these NGOs to their full operational status," spokeswoman Michelle Montas said. Sudanese government officials "have insisted on accompanying some (international non-governmental organization) staff members into their offices and taking lists of assets and staff," Montas said. She called the aid agencies who had been kicked out "the main providers of life-saving humanitarian services, such, as water, food, health, and sanitation. Their departure will have an immediate and serious impact on the humanitarian and security situation in North Sudan, (and) especially in Darfur." Sudan's ambassador to the U.N. declined to confirm any details on the subject. But Abdalmahmood Abdalhaleem Mohamad said: "We will deal very firmly with any organization that is violating the hospitality and the laws of the country." The Dutch section of Medicins Sans Frontieres (Doctors Without Borders) said in a statement it was "outraged" by the move, which leaves more than 200,000 of its patients without essential medical care. Other sections of MSF continue to operate in Darfur, it said. Oxfam, which is based in England, urged Sudan to reverse its decree. "If Oxfam's registration is revoked, it will affect more than 600,000 Sudanese people whom we provide with vital humanitarian and development aid, including clean water and sanitation on a daily basis," Penny Lawrence, Oxfam's International Director, said in a statement. The agency's statement added that "400,000 of them are affected by the ongoing conflict in Darfur -- where people continue to flee from violence and the humanitarian needs remain enormous. It will also affect another 200,000 poor people in the east of the country and Khartoum state." The agency has 450 staff in the country, 90 percent of whom are Sudanese, it said. It emphasized in the statement that it has "absolutely no links to the ICC. Oxfam does not have an opinion on the Court's activities, and our sole focus is meeting humanitarian and development needs in Sudan." The International Rescue Committee, which has worked in Sudan for nearly 30 years, said that it had been ordered to close its programs as well. "We are extremely distressed by the forced closure of our aid operations," said George Rupp, the group's president and CEO. "It appears the international aid effort in the region is being shut down and that raises grave concerns about the welfare of millions of Sudanese people who rely on humanitarian aid for survival." The ICC order to arrest al-Bashir is the first warrant ever issued for a sitting head of state by the world's only permanent war crimes tribunal, based at The Hague in the Netherlands. CNN's Terence Burke, Barbara Starr and Phillip Warrington contributed to this report.